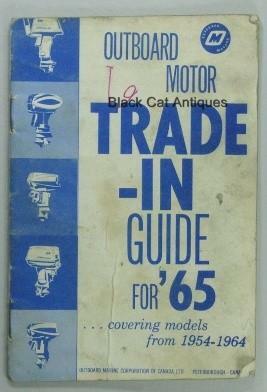 Up for sale, we are offering an original, 1965 OMC, Outboard Motor Trade-In (pocket) Guide for Outboard Models from 1954 to 1964. This is a used guide from a local marine and small motor business with valuable outboard motor information. Condition: This trade-in guide is used and soiled with wear and ink notations on the cover, however it is easily readable and useable. Please enlarge the photos to determine the condition of the guide. Size: The guide measures approximately 5" long by 3.5" wide.